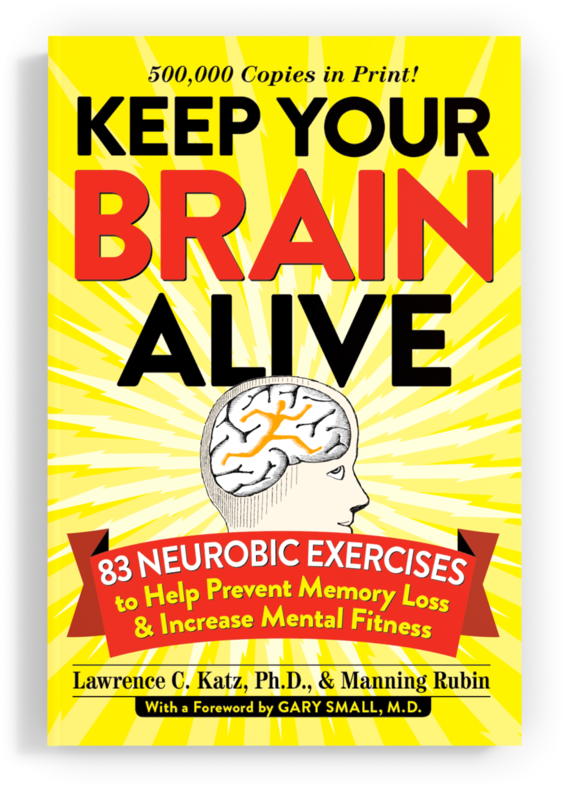 How a Neurobic exercise works. Here's an example we use in the book of Jane returning home from work and entering her apartment with her eyes closed. What is actually happening in her brain that makes these few minutes of her day a Neurobic exercise. “Jane reached into her pocketbook and fished inside for the keys to her apartment. "Did I forget them?! No, here they are. She felt their shapes to figure out which one would open the top lock”. Jane's keys are in the depths of her handbag, which is filled with dozens of different objects--eyeglass case, lipstick, tissues--each with a different texture and shape. Instead of using vision to quickly find the keys, as she might routinely do, she relies now on her sense of touch. Because getting into her apartment is important to her, her brain's attentional and emotional circuits are alert and active as she touches the hard, smooth exterior of her lipstick case, moves past the soft feel of tissues and eventually identifies the keys. In her brain, long-dormant associations are being reactivated between the areas of her cortex that process touch, areas in the visual part of her cortex that hold the mental "pictures" of objects, and areas of the brain that stores the names of objects. This reactivation causes specific groups of nerve cells to become more active in an unusual pattern for Jane. This in turn can activate the cells' neurotrophin production and strengthen and build another set of connections in her brain's "safety net". Normally, placing a key in a lock uses a "motor memory"--an unconscious "map" in the parts of our brains that control movement--in conjunction with vision, which provides an ongoing feedback that allows us to sense where parts of our body are in space (this is called the proprioceptive sense). But this time Jane is trying to fit a key into a lock using the motor map in conjunction with her tactile, not visual, sense. And this non-routine action is activating and reactivating seldom-used nerve connections between her sense of touch and her proprioceptive sense. On most days, and in most situations, Jane, like the rest of us, makes her way through the world using sight as a guide. Over time, her visual system has constructed a spatial "map" of her world in various parts of the brain. Her other senses of touch and hearing have also been tied into these maps, but these non-visual connections are rarely used in this situation. Today, however, Jane is using her sense of touch to trigger a spatial memory of the room in order to navigate through it. The touch pathways that access her spatial maps, usually inactive, are now critically important for accomplishing this simple task and unexpectedly get exercised. And the same holds true for her other senses. Here, Jane's olfactory system is kicking into high gear to do something it rarely doesãhelp smell her way through the world. The olfactory system has a direct line into the hippocampus, which is the area that constructs spatial maps of the world. The odor of the roses is working at several brain levels. The emotional association of roses with her birthday, combined with an important emotional goal of getting to her answering machine and retrieving messages from her family, makes them a strong, meaningful stimulus. Now Jane is constructing a strong new association--not only are flowers something that smell good, and make you feel good, but they can show you where you are in part of your world (and start the production of brain food in another set of brain connections ). Yes, it was. By spending just a few minutes getting into her apartment with her eyes closed while doing all the things she normally would do when coming home, Jane had engaged literally dozens of new or rarely used brain pathways. Synapses between nerve cells were strengthened by these novel and challenging activities. And in response to their enhanced activity, some of Jane's brain cells were beginning to produce more brain growth molecules, like neurotrophins. Furthermore, as a result of the exercise a small but significant change has occurred in Jane's brain. New sensory associations like the feel of the leather armchair and the smell of the birthday roses remained with her as part of her brain's vocabulary when she entered the living room the next day.